It is almost certain that there is no thing amongst Gemini, in which they wouldn't be interested. They want to try everything and to see how it works. They are very curious, because at all costs try to satisfy their curiosity by collecting different information, and widening their knowledge. From a perspective of the observer it is, of course, very interesting and worth following. 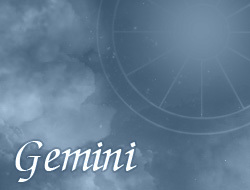 Gemini must always know what is happening around them, they are everywhere. They have a tendency to gossip and meddling. Unfortunately it isn't too positive character trait, but persons born under this zodiac sign just are such, and can’t do anything with it. Such people are eloquent – it is possible to talk with them on every subject, so clumsy silence won’t be a problem. Even though they transmit a lot of information, still retain mystery, that’s way persons with curiosity listen what these persons have to say. Persons under the sign of Gemini have a wide range of interests and abilities, which allow them to achieve success in many areas. Sometimes it is possible to be under impression that they are able to have different personalities, what for people from other zodiac sign is simply unavailable.